Today I'm testing out Goo Gone Barbecue Grill Cleaner as part of the #GooGonePassionProject. You are probably wondering what I mean by the Goo Gone Passion Project. This story dates back to early July when Amber emailed. She said Goo Gone had noticed my blog and my passion for grilling. "During the next few weeks, we’d like to send you a very cool, valuable item that we think you will really get excited about. The catch is that it will come with a little imperfection that will only take a few minutes to fix," she said in her email. To be honest, I've seen emails like this, and the exciting "thing" has turned out to be an email photo. Photos are fine, but I can't really tell readers much about something I have not seen or used. That's what makes my blog special. I try things out at home with my family, and I share the best data that I can. I do like to help readers, so if my schedule is not too packed, I'll try out most anything, unless I'm sure I won't like it. No fig barbecue sauce. I'm sorry. I just really hate figs. So, I don't think it's fair to test something when I know it's going to make me gaggy. Actually, I forgot about this email, since it had been a few weeks. Then, the FedEx man pulls in right as I'm about to get in the shower. I think the FedEx man does this on purpose. I peek out the window with only my eyes showing and see that he puts a huge box right behind my Jeep. It's almost time to go to work, and I'm blocked in. So, I shower quickly and go to examine the big box. Wow! There's a Weber Smokey Mountain 22.5 inch behind my Jeep. I didn't order a smoker. Has this dropped from heaven? No. I did see the FedEx man, but I am rather confused as I drag the smoker box in the garage. I also have a small package compliments of the FedEx man, so I take that inside and quickly open it before I have to head off for work. The mystery is solved. 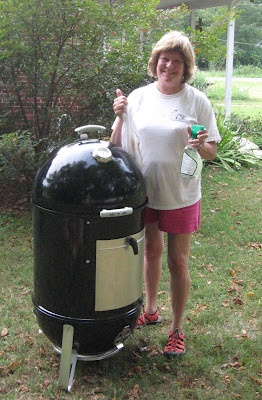 Goo Gone explains that the smoker is part of the #GooGonePassionProject. Now, it's the weekend, so one of my guys puts the used Weber Smokey Mountain Bullet back together, since it's disassembled to fit back in the box. 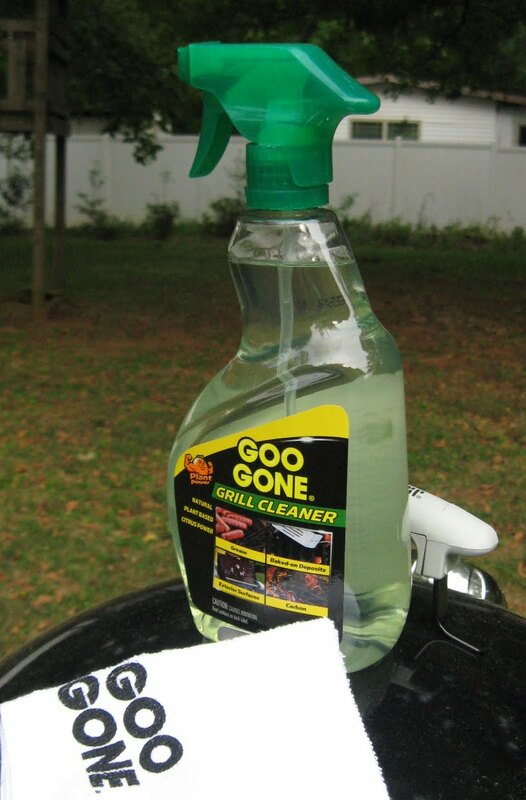 I get the Goo Gone out and get ready to test out this new grill cleaner. The Weber smoker is great (of course - I have the small one), but my real task is to find out if Goo Gone actually works. First, let me say that Goo Gone did, indeed, send me a dirty smoker. That kind of cracks me up, since I've never had a company intentionally send something dirty. But, that's the whole point of the Goo Gone Passion Project - to see if the grill cleaner works. I could certainly come up with some dirty grills to test out. SHHHH. We won't tell my Mom that. She does not believe in dirt or spider webs or dust balls. I can attest that the overall smoker was not totally cruded up, but the lid and grates clearly needed some elbow grease. 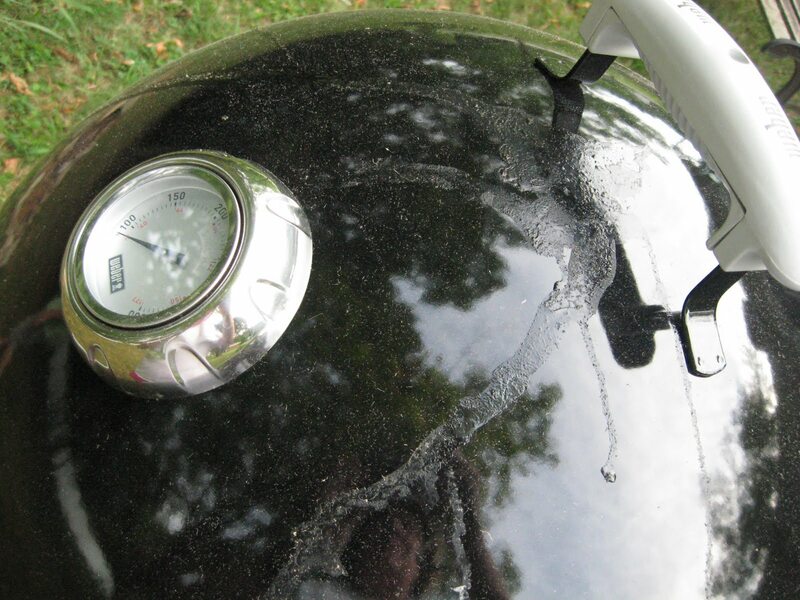 The directions from Goo Gone Grill Cleaner say to spray on the product and wait for one to two minutes. Gotta love easy and quick. But . . . will this stuff work? I squirt the Weber Bullet lid with the Goo Gone with visions of smoking something tomorrow and hoping that the grease does come off without a whole lot of work. I begin wiping as instructed, and the grease splatters wipe off easily. Goo Gone sent the cloth for cleaning as well, and I, being the frugal type, kind of cringe about using a brand spanking new dish type cloth on a greasy grill. But, I decide to follow all the directions. The Goo Gone towel is a regular towel though, so you don't need anything special to use the product. Here you can see that I'm wiping the Weber Bullet. I'm using almost no pressure. I'm not sure you can see that, but I'm vibing my hand not being put to any real test here. Here you can see that my smoker from Goo Gone looks brand new. I could put it on the store floor, and I'm sure no one would guess that it had been used for a test smoke before the cleaning. Yes. I Can See Myself in the Smoker (and you can too in this photo). 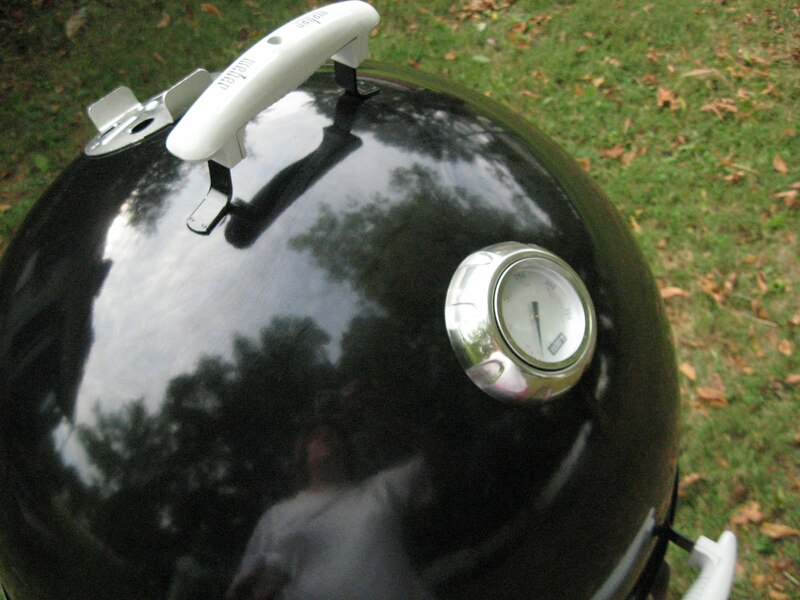 In case you aren't sure by the full shot or are blinded by the fact that I wear pink shorts with red shoes (not to confuse a barbecue blog with a fashion blog), here is the close up of the Weber lid. If you can see any grease, then I will get my reading glasses and go back out and check again. I do thank Goo Gone for the Weber Bullet and for the Flip video cam and maybe I can get over my shy and do some video too soon. I splatted a turkey ball right in the middle of the last video attempt - not to mention some very random and spazzy out takes that I edited out. As always, I tell it like it is (or how I see it anyway). 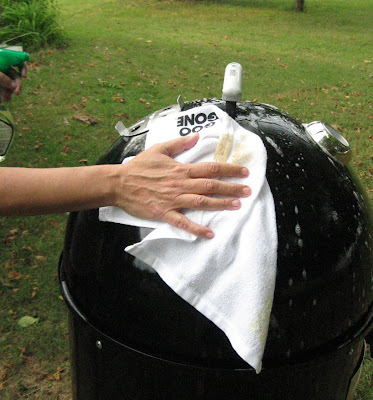 Goo Gone Grill Cleaner took care of the grease on the WSM smoker with almost no effort on my part. I'll be trying it out on some of my other dirty grills and reporting back, but I'm going to go thumbs up. Goo Gone worked just as promised on the test drive, and I have looked high and low for grill cleaners. My "go to" prior has been Dawn dish washing liquid (great stuff - suggested by my plumber), but that's more work than this spray which did cut through and clean up the grease. You can read more about the Goo Gone Passion Project and check out the other stories on the Goo Gone Facebook page. I know you must get this a lot, but it is so refreshing to see a woman at the helm of a big grill. 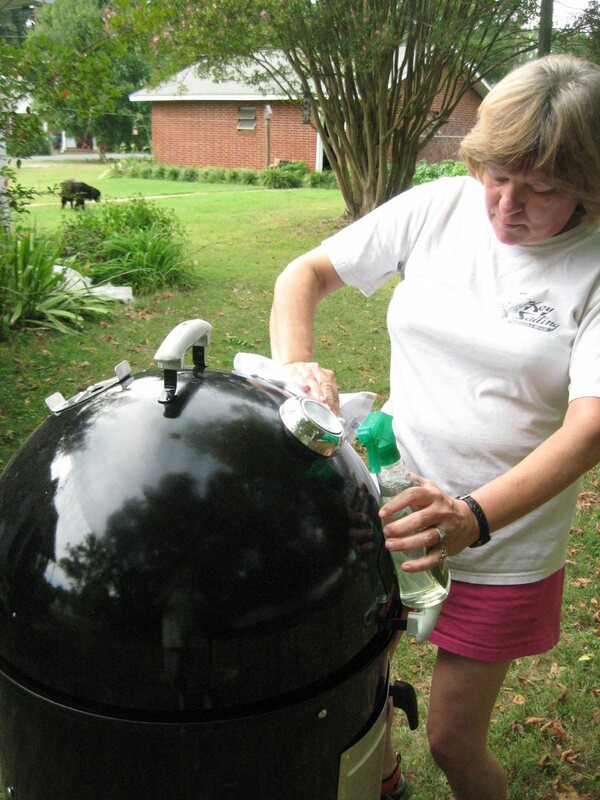 BBQ has so long been a stereotypically male activity that it always feels good to see a woman behind the grill. Nice article as well..I'll share it with my Twiiter and blog followers soon! 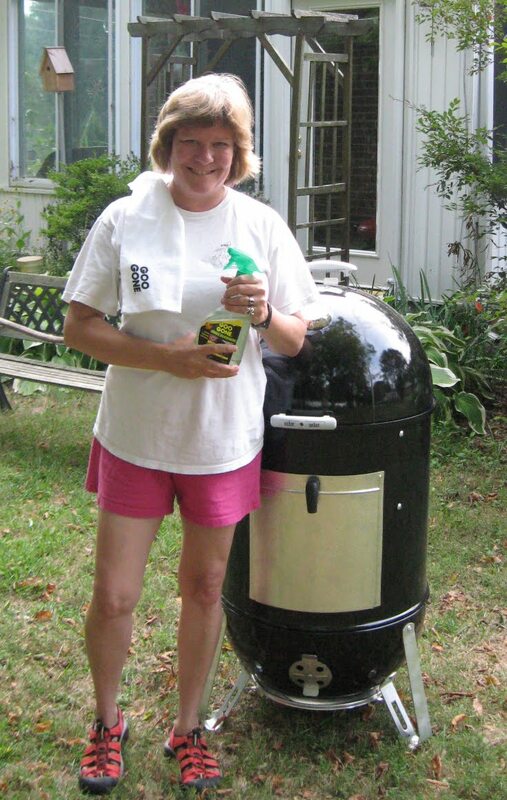 Thanks for sharing my Goo Gone Grill Passion Project cleaner story. I checked your site out too. Nice work. Readers . . . you can click Kevin's name here in comments and get loads of great grilling information. Really, I've not had many people say anything about my writing on grilling and barbecue and being female. The Barbecue guys and folks online have been cool about my hobby. I rasied sons, and they were more likely to help out if I grilled than if I made dinner in the kitchen. Cooking outside was more like a party than doing chores. My sons are in college, but they still check online at my spaces to get the grilling recipes and tips. Some of my college students do too. So, I can post and help out and anyone can read and hopefully have a terrific grilled meal (and many of them super easy to make). That is an AWESOME promotional idea one of the most creative I've seen. I'll keep my eye out for the Goo gone grill cleaner. I already use the regular Goo Gone at home and work, fantastic stuff. Does the grill cleaner have a strong citrus smell like the regular cleaner? Hi Chris! Yes. The product is citrus based and has a nice scent. I'm not sure about how strong the scent is, because my allergies are acting up. Nice review. You have the Goo Gone towel and everything! And the grill looks really clean. Thanks for sharing this blog. I was buying some of this today as I love their regular goo gone (have used for years since picking up at a trade show in Chicago before it was even on the mass market)and I am hoping it will work on my white gas stove in the kitchen. The spill-overs are killing me! Love Weber and their products and am looking forward to reading more of your blog. Great product and what a nice touch to send the smoker. All of your blogs are great and show what a passion you have for grilling and cooking, so getting the thumbs up from you is really saying something. If you'd like a pink tiara to wear with the shorts and shoes, I think I know where I can find one! Interesting promotional tips! 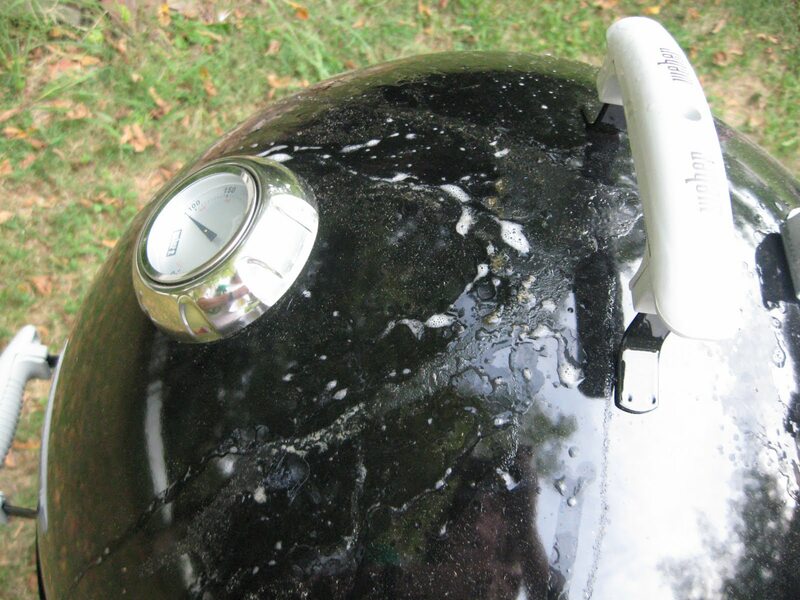 Greasy clumps of burnt food that accumulate on this grate can give a bad flavor to the next round of food you grill. A long-handled bristled brush should do the trick just fine. Brilliant post and what a desirable product. Would definitely make extremely great use of that to clean my brand new weber bqq. That is one amazing looking BBQ. Never seen one like that before. Where can I get one? From those pictures it looks like it came up a treat using the Goo Gone Grill Cleaner. 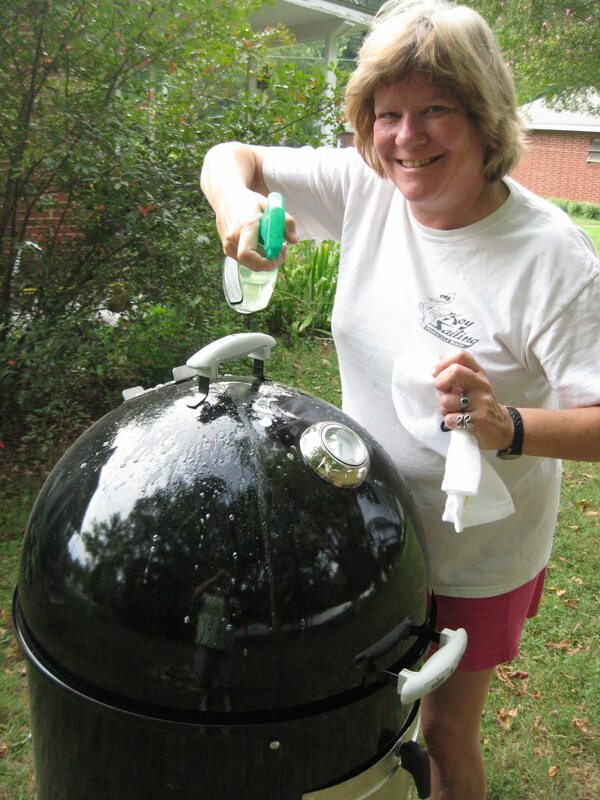 I must investigate this BBQ and cleaner product more. That a Weber Smokey Mountain Bullet. It's the 22.5 which is larger and has a built in thermometer. I love it. Easy to use. Great results.